"Play Fair at the Olympics", a campaign calling for Olympic values of ethics and fair play to be applied to the world's abused and exploited sportswear workers in this Olympic year, has arrived in Athens, home of the Olympics. What progress have we made so far? The biggest anti-sweatshop mobilisation ever? August 2004 - This has been a creative and highly energetic global campaign with active participation of trade unions and labour rights organisations from all around the world, both in the consumer and the producer countries. Hundreds of organisations and many top athletes have participated in over 35 countries and more than half a million signatures have been collected in support of the campaign. The extent of actions at the sub-national level, which we estimate at over 500 local events, has also been impressive, and has helped contribute to extensive coverage on television, radio and in the press all over the world. The European Parliament passed a resolution supporting the campaign aims, the British Parliament passed a motion supporting the campaign, and a bill entitled "Play Fair at the Olympics" was introduced in the US Congress. Many members of several national parliaments also supported the campaign. This mobilisation has made it abundantly clear to the sportswear sector that consumers and workers all share the same concerns about the abuse and exploitation of workers which lie behind the public face of much sportswear production. The start of an industry-wide solution? We have succeeded in bringing seven major sportswear multinationals around the table with the UN's International Labour Organisation (ILO) to discuss our proposal for a "Programme of Work" to take us from Athens to Beijing, designed to bring an end to ongoing labour abuses in the sportswear industry. The World Federation of the Sporting Goods Industry is at present considering this joint programme of work and we hope they will agree to work with us to implement it. In July it established a new committee on "corporate social responsibility" which will discuss our proposals at their meeting in September. We will be publicly reporting on progress (or lack of it). Parallel to this industry-wide approach the campaign team has met individually with 4 of the 7 highlighted companies (Puma, Asics, Mizuno and Umbro) to discuss how to improve their labour practices. In general the meetings were constructive. Campaign representatives discussed the findings outlined in the report, and clarified the campaign proposals. - call upon the World Federation of the Sporting Goods Industry to play a more active role in putting forward an industry wide benchmark, specifically to facilitate progress for the smaller companies such as Lotto, Mizuno and Asics. The FLA member companies (including Nike, Reebok, adidas and Puma) jointly responded to the Programme of Work that was presented by the campaign and confirmed the central importance of promoting freedom of association and the need for additional guidance for monitors on this issue, and for developing remedial strategies that provide workers with the awareness and the environment needed to form or join organizations of their own choice. FLA companies will also work to develop more effective complaints mechanisms and new forms of dialogue and cooperation with local stakeholders. Has welcomed campaign input on improving worker participation initiatives. Is addressing freedom of association issues by focusing on worker representation programmes in the field. Actively pursuing a programme to prevent blacklisting of trade union representatives in factories. Supports a sectoral approach. Open to a role for the ILO in a sectoral approach. Our campaign report helped in thinking on ways to improve implementation of code of conduct. Welcomed future contacts. Was one of the first companies to invite the campaign to its HQ to discuss the campaign report and explore collaboration. Open to working with local organizations in support of internal monitoring efforts. Working with a researcher to investigate the connection between code implementation and purchasing practices. Willing to discuss attendance at a regional consultation and planning meeting in Asia in 2004. Supports the proposal to hold a multi-stakeholder conference in Asia including local suppliers, unions and NGOs. They would welcome involvement of the ILO in facilitating such a meeting. In sourcing countries, it is talking to government officials about freedom of association issues. Responding much later were Lotto, Fila and Kappa. Lotto has proposed to take the lead in organising a meeting at sector level in Italy, Fila has agreed to meet with the campaign after the Athens Olympics and Kappa indicated a willingness to organise a meeting. An evaluation of the company responses, which can be found here, provides more detail on progress made by individual companies. In discussion with individual companies to clarify aspects of the Olympics report, these companies have been willing to share the locations of some of their suppliers with the campaign allies. This is something few sportswear brands have been willing to do in the past, and it increases the possibility of monitoring workers' rights at the workplace. Those companies who commit to the Fair Labor Association will be opening up their supply chains to greater scrutiny, which is a positive development. The International Olympic Committee (IOC), while categorically refusing to take responsibility for workers' rights in the Olympics sponsorship and licensing programmes at global, national and games level, has nevertheless agreed that the campaigns aims are in the spirit of the Olympic ideals of fair play and ethics, and have agreed to participate in the industry-wide dialogue to tackle workers' rights abuses in the sportswear sector. Many national Olympic committees and several athletes have supported the campaign call for an end to the abuse and exploitation of workers in the sportswear industry. The Torino 2006 Winter Olympic Committee (TOROC) has adopted a "Charter of Intents". The charter may be a contribution to the defininition of ethical standards for global sporting events. On this basis, TOROC has expressed an interest in discussing with the campaign ways to improve social and ethical values in sport in autumn 2004. IOC still ducking and diving: The IOC is famous for its arrogance and lack of accountability, and our experience has done nothing to dispel this impression. The IOC, in spite of expressed willingness to participate in sector wide discussion, told us it is not prepared to discuss its own responsibilities to workers through its billion dollar global sponsorship and licensing programme. It also denied its responsibility, in contradiction with the Olympic charter, that it has a say in sponsorship arrangements for national Olympic teams. While we have proposed very little (basically strengthening licensing and sponsorship complaints mechanisms vis-à-vis sportswear companies and adding some workers' rights specific language to the Olympic charter), the IOC has "stonewalled" the campaign completely. While making misleading statements in the media about our campaign, any attempts to move the dialogue forward privately were ignored. The IOC refused to accept the signatures of half a million campaign supporters around the world calling for change across the sportswear sector. Industry body not running with the ball: The World Federation of the Sporting Goods Industry (WFSGI) did not in any meaningful way respond to the contents of the campaign proposals, despite ample opportunity to do so. Furthermore, it failed to give any indication on how it will address the failure of most of its members to follow its own basic code of labour practice. We have, in one of the biggest ever mobilisations against inhuman working conditions, powerfully conveyed, particularly to some of the lesser known sportswear brands, that they can no longer ignore the issue of workers' rights, or their collective responsibility along with their suppliers for labour abuses involving workers having their rights violated and being forced to put in long hours of forced overtime for poverty wages. The campaign has won the debate that current practices on individual corporate ethical codes of conduct have failed to deliver their stated objective of averting labour abuses; and that powerful brands need to integrate their fair labour pledges into their purchasing practices in the global supply chain. Most significantly, we have pushed the sportswear industry to begin discussing an industry-wide solution. We hope that they seriously commit to this process and we will be publicly reporting on progress. The IOC's refusal to play a pro-active role in solving this problem is intensely disappointing, but we will continue to campaign to ensure that the Olympic ideal extends to the women and men who make the world's sportswear. 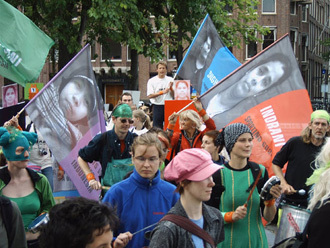 June 22nd 2004 a colourful procession marched through the streets of Amsterdam as part of the international "Play Fair at the Olympics" campaign. New campaign calls for sportswear companies to clean up their act. respect for universal fundamental ethical principles. This report shows that the business practices of major sportswear companies violate both the spirit and the letter of the Charter. March 2004, The report includes information on Puma Fila, Umbro, Asics, Mizuno, Lotto, Kappa, and New Balance. They have been labeled "B" brands because, in terms of their market share, they form a second rung of manufacturers in the sportswear industries, just below the market leaders or the so-called "A" brands: Nike, Reebok and Adidas. 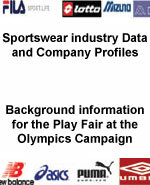 June 2005, The Play Fair at the Olympics Campaign has urged 'sportswear companies and the International Olympic Committee to bring about an industry-wide solution to the abuse and exploitation of workers in global sportswear supply chains'. Toward this aim, seven companies - Asics, Fila, Kappa, Lotto, Mizuno, Puma, and Umbro - were highlighted during the international public campaign. 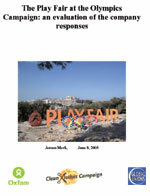 A Play Fair Alliance evalution of the WFSGI response to the Play Fair at the Olympics Campaign. April 2005, The aim of this report is to present an accurate reflection of the dialogue which took place with the WFSGI. July 2005 - After months of relentless campaigning, the organisations taking part in the "Play Fair at the Olympics" campaign took stock of their achievements. On December 16-17, 2004 an evaluation meeting was held by the campaign's steering group, which is made up of representatives from Asia Monitor Resource Center (AMRC), the CCC, Global Unions, Oxfam, and the Thai Labour Campaign. Clean Clothes Campaign update on progress in the sportswear industry on workers' rights for Turin 2006. Jan 2006 - From the 10th to 26th February 2006, the Olympic Winter Games will take place in Turin, Italy. Two years ago, to coincide with the Athens Olympic games, an international alliance of trades unions, labour rights groups and NGOs came together under the banner of the Play Fair Alliance to campaign for the Olympic ideals of respect, dignity and fair play to be respected in the global sportswear industry. The Olympic Winter Games mark the halfway point between the Olympic Games in Athens and the Olympic Games in Beijing, and so it is time to take stock of the steps made by the companies and organisations highlighted. 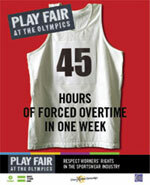 Feb 2006- The Play Fair Alliance, which brings together trade unions and labour rights groups worldwide launched a campaign at the 2004 Athens Olympics to urge the IOC and sportswear brands to take action to weed out the exploitation endemic to the industry. At the occurrence of the Turin Olympics, the Clean Clothes Campaign published an update on the steps being taken by the brands, the World Federation of Sporting Goods Industries and the Olympic family since the Athens Olympics. During this Olympics we especially express our dismay at the IOC's lack of commitment to ensuring that the Olympic ideals of respect, dignity and fair play are respected by the global sportswear industry. Despite having received wide support from various National Olympic Committees for the Play Fair campaign at the conference, Jacques Rogge, head of the International Olympic Committee, was reluctant to accept the "Play Fair at the Olympics report". When a copy was offered to Mr. Rogge as he left the conference he refused it, saying: "I don't know what you're talking about", as he got into his car and left.